The annual Western States Hockey League Board of Governors meeting isn’t exactly a made-for-TV event but the 2013 version, which was once again held at the Stratosphere Hotel and Casino in Las Vegas, Nevada, featured a lot of news that may interest fans and players alike. First and foremost, the WSHL continues to expand and has added two teams into the fold for the 2013-2014 campaign. The Missoula (Montana) Maulers make the jump after spending the last two seasons in the American West Hockey League and a franchise in Fort Collins, Colorado, which has yet to be named, has also been approved. A franchise in Oklahoma City, Oklahoma has also been confirmed to join the WSHL but won’t begin play until the 2014-2015 season. The addition of the two new squads for the 2013-2014 season means the league will feature four, six-team divisions, for a total of 24 member clubs, balancing out nicely for the first time in a while. Missoula will jump right into the Northwest Division, where they’ll join the Thorne Cup and United Hockey Union National Champion Idaho Jr. Steelheads, along with the Southern Oregon Spartans, Seattle Totems, Ogden Mustangs and Salt Lake City Moose. Fort Collins’ arrival makes things a bit trickier and tougher on one team in particular, the El Paso Rhinos. The Rhinos played the 2012-2013 season as part of the Mountain Division, along with the Boulder Bison, Cheyenne Stampede, Phoenix Knights, Arizona Redhawks and New Mexico Renegades and the move form the Midwest division cut down significantly on their overall travel. With Fort Collins set to play in the Mountain Division, Rhinos Head Coach Cory Herman did the league a favor by switching back to the Midwest Division to join the Dallas Ice Jets, Dallas Snipers, Texas Brahmas, Tulsa Jr. Oilers and Wichita Jr. Thunder. The move will re-ignite rivalries with both the Ice Jets and Brahmas but may only last one season, as Oklahoma City is expected to move into the Midwest next year, which could put El Paso back into the Mountain Division but that remains to be seen. The Pacific Division is the only division with no changes, as all six teams return, including the Fresno Monsters, who are back in full force with head coach Bryce Dale at the helm of the elite franchise. As far as rules go, the only real change has to do with the regular season overtime procedure and will now mimic what numerous other leagues have recently turned to, with good reviews. During the regular season only, games that end in a tie after 60 minutes of play will then move to the usual four-on-four overtime period, lasting five minutes. In the past, if still tied, the two teams would then head to a five-man shootout and eventually a sudden-death format if the game had still not been decided. The change comes in the form of a three-on-three, five-minute overtime period that would follow the four-on-four frame and be held prior to a three-man shootout. The new rules is said to cut down on shootout losses and make it so the best team during gameplay has a better chance of getting the win. Another small change comes in the form of uniforms, as over the last two seasons the league has designated that home teams wear dark uniforms. Following a rule that the Central Hockey League currently utilizes, the WSHL will now have home teams wear their white uniforms up until January 1 and then switch over to dark while at home until the conclusion of the regular season and playoffs. Playoff procedures, cross-over schedules (inter-league match-ups), Western States Shootout scheduling/information, Thorne Cup bidding and UHU National Championship information will be available at a later date. The Pikes Peak Miners are proud to announce the addition of Kevin Holmstrom to the 16U coaching staff. Kevin brings 20 years of knowledge and high-level coaching experience to the Miners organization. While coaching with the PPAHA Jr. Tigers, Colorado Thunderbirds and Colorado Rampage he has lead several teams to State and District championships. His teams have advanced to the Tier 1 USA Hockey National Tournament on five separate occasions over four age groups. Coach Holmstrom has been a long-standing and important figure in the Colorado hockey community. Along with his 20 years of coaching, Kevin served as the Pikes Peak Amateur Hockey Association president and was on the board of directors with Colorado Springs following the PPAHA merger. His influence on the growth and development of Tier 1 hockey in Colorado and throughout the Rocky Mountain District cannot be downplayed or overlooked. Numerous former players have been very successful in advancing to the Junior, College and the Pro ranks. “Kevin has probably influenced more Colorado players who have advanced to D-1 and Professional hockey than any coach in the Rocky Mountain District. I coached against his Bantam and 16U Thunderbirds teams from about 2002-2006, and I’m not sure I’ve seen harder working or more disciplined teams in the years since then,” states Miners 16U head coach, Lucas Trombetta. Kevin is enthusiastic about his return to the Colorado Springs Amateur Hockey Association with the Miners 16U team. He states, “I am excited to bring not only a high energy level to the team, but just as importantly, another source of knowledge and direction for each individual’s future.” Coach Holmstrom lives in Colorado Springs with his wife Michelle, who has volunteered countless hours in youth hockey over the years. His sons, Josh and Ben, both grew up in Colorado Springs playing for the Pikes Peak Amateur Hockey Association. Josh will be a senior playing hockey at UMASS-Lowell (NCAA Div-1), and Ben is playing professionally with the Philadelphia Flyers. The Colorado Thunderbirds are pleased to announce that the following players from our U18 and U16 teams have signed tenders or were selected in the NAHL Entry Draft. Las Vegas skater Cory Ward, a freshman, had a team-best 3 short-handed goals for Bemidji State this past season. 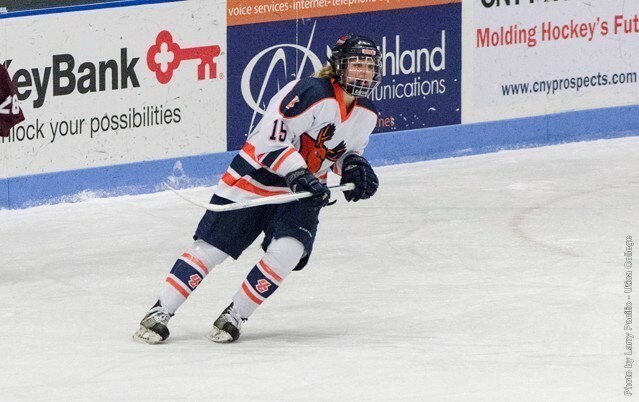 Utica, NY – Junior Megan Myers (Las Vegas, NV) of the Utica College women’s hockey team was named a CCM Division III Second Team All-American announced at the women’s frozen four in Superior, WI. Myers is one of just 12 players from the east region to receive All-American honors. The forward finished the season ranked third in the conference with 31 points (17 goals, 14 assists). She is a two-time ECAC West First Team selection. This past season she became just the third player in program history to reach 100 points in her career, joining All-Americans Stephanie Price ’07 and Deana Wiegand ’07. She ranks second on the College’s all-time goal scoring list with 55 career goals and is third all-time in points (104). She has totaled at least 30 points in each of her first three seasons. The Pioneers finished the season with a 16-9-2 overall record. They lost in the ECAC West semifinals to Elmira College, who is one of two ECAC West teams in the women’s frozen four. There is buzz that two former AAA L.A. Selects players – goalie Eric Comrie and goal scorer Adam Erne – will be selected in the first or second round of the NHL draft. Comrie was a top goalie last season for the WHL Tri-City Americans with a record of 26-14-3, 2.62 gaa. He is the brother of NHL forward Mike Comrie. Erne, a left wing who played a season with the USHL Indiana Ice, this past season was a 28-goal scorer in the regular season, then added 5 goals in a playoff run with the Quebec Remparts. The NHL draft is scheduled June 30 at the Prudential Center in Newark, N.J.
//Las Vegas skaters Joey Sullivan, Gage Quinney, Brendan Harris, Ethan Montoya, Eric Williams and goalie Chase Smith will be at the Great Western Futures Showcase which begins today at the SoBe Ice Arena inside of the Fiesta Stations Hotel-Casino on North Rancho Drive. //Sullivan signed recently with the USHL Indiana Ice.